Bitcoin Users Worldwide was a space where nearby Bitcoin users can find contact information on each other and engage in local trade. As of June 2013 the domain name is not used for more than advertising. 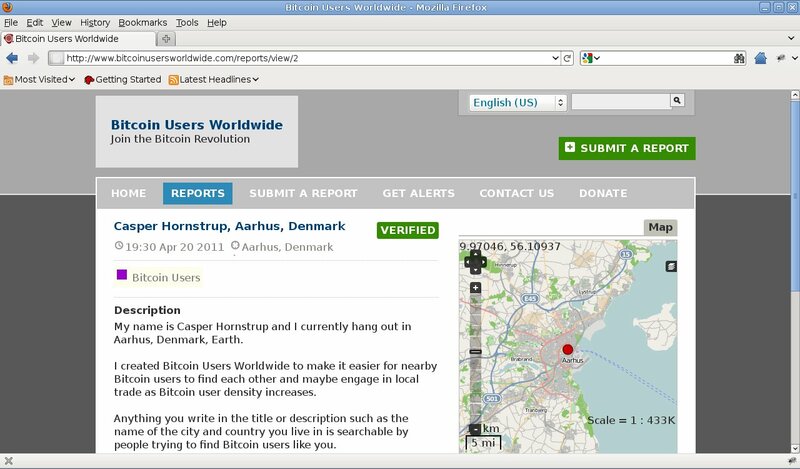 A Bitcoin user can add an entry with a title, description and location such as the city and country they live in to a database. A description can include contact information such as an email address, what products and services the Bitcoin user can supply or want to buy in exchange for Bitcoins. Other Bitcoin users can then search for nearby Bitcoin users using location and product and service names and they can even get email notifications when new nearby Bitcoin users add entries to the database in the future. Bitcoin Users Worldwide is a free service for the Bitcoin Community. Bitcoin Users Worldwide can help speed up growth of the Bitcoin economy because it makes it easier for local supply to reach local demand and for suppliers to estimate local demand. This page was last edited on 24 July 2013, at 07:14.